The Colorado Institute for Conflict Resolution & Creative Leadership (CICRCL) is a Colorado nonprofit tax-exempt corporation founded in October 1986, and received Federal 501(c)(3) tax-exempt status as an educational foundation in 1991. CICRCL’s tax-exempt status as a foundation permits it to receive private and public donations to support its mission. CICRCL’s motto, Evolutionary Resources for Shifting Consciousness, describes its social mission, and the underlying principles that are expressed through its various projects, programs, and products. To cooperate with other persons, organizations, and corporations to educate the public on the peaceful resolution of conflicts and creative living. CICRCL was created as the result of our experiences related to the Chernobyl nuclear disaster. During the first half of 1986, Barry was on sabbatical from his position at the University of Colorado-Colorado Springs (UCCS). We arrived in Zurich, Switzerland in January, on the day the Challenger exploded at Cape Canaveral, Florida–an event that set the tone for our six month stay. We rented a small apartment in a village located on Lake Zurich, purchased a small used car, and settled in to study Process Oriented Psychology (POP) with Dr. Arnold Mindell at his Institute. This was during the time that Janae was pursuing her PhD degree, and we both participated in numerous POP trainings and workshops as part of our professional development. On April 26th Reactor #4 at the Chernobyl power plant exploded. For three days afterwards, we and all the people in Eastern, Central, and Western Europe were outside enjoying the mild spring weather, unknowingly being exposed to a 1000x increase in nuclear radiation. On the fourth day, Soviet Union officials announced the explosion, and were met with outraged reactions from their nation-state neighbors. Soon after the announcement came three days of torrential rain–it was as though Mother Earth was in deep grief and flooding us with her tears. The unfolding implications of the explosion became a life-changing event. The image to the right shows the path of the fallout from the disaster. During the days of unending rain, our POP group spent many hours processing this disaster, trying to make meaning of it and harvest something positive from it. It was very very challenging, as we began to feel despair, not only about the catastrophe itself but that it could even happen! We concluded that the biggest problem was an ethical one. 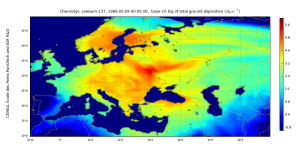 The Soviet Union’s delay in informing its neighbors about the explosion and widespread contamination exposed millions of people to levels of radiation that put their lives at risk. This unconscionable act, a dramatic example of a nation-state failing to act in integrity and in ways that put the whole planet in peril, was the catalyst that would lead to our decision to create CICRCL. Over the next three months, we watched as radiation-contaminated fresh produce, milk products, and meat disappeared from the supermarket shelves. While there was plenty of this food available, it was too toxic to consume. Supermarkets eventually brought in fresh produce grown under glass in Italy and Spain at very high prices. This food shortage and the shock surrounding the catastrophe stunned Europe was palpable. It was a reality-altering personal and collective experience. After we deliberated for a long about how to transform this disaster into something meaningful, we decided in October 1986 to found CICRCL and use it as a vehicle for conducting research in the field of conflict resolution. We began our research by organizing two international conferences on conflict resolution–a 5-day in 1987 and a 3-day in 1988 . We invited Dr. Mindell as the keynote presenter at both, and had 50+ other presentations from cutting edge thinkers and doers from around the world at the first conference. These two conferences helped us see the big picture in the field of conflict resolution. We were able to identify both what was working in the field, and also where there were holes–what was missing. We used this information as the foundation for creating CICRCL’s Partnership Approach to resolving conflict. Our Developmental Systems Theory, which looks at the developmental sources of conflicts, grew out of systems theory. It uses the same principles and practices for resolving conflict in both micro and macro systems. 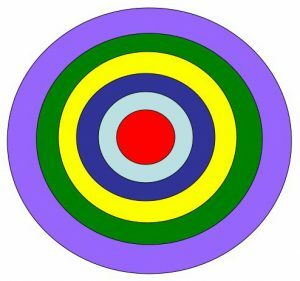 This image to the right illustrates our systemic model, with the individual in the center and humanity in the outer ring. The two of us began offering conflict resolution workshops through CICRCL to counseling students from the University. They were so well received by the students that we began teaching an elective course in the Counseling and Human Services Program. Students eventually requested that the course be required as part of the curriculum. We taught the course together many times between 1990 and 2000, and eventually consolidated all of the material into a textbook format. Conflict Resolution: The Partnership Way, now in its third edition, has become a classic in the field of conflict resolution. 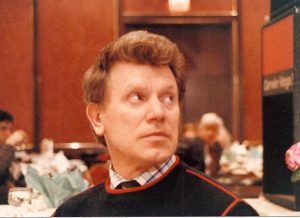 In January of 1988, between our two international conferences, we attended the First Soviet-American Citizens Summit in Washington, D. C. This landmark event, which brought together 100 Soviets and 500 Americans as part of the Soviet détente, allowed us to have many free discussions about our common interests as human beings, our experiences of the Cold War, and our dreams and visions for the future. Barry found his Soviet counterpart in Mikhail Zykov, a philosophy professor from Moscow State University. In the fall of 1989 Zykov and a colleague visited us in Colorado Springs, and they invited us to visit the Soviet Union the next year. Zykov organized one of the first Citizen Diplomat tours that involved home stays with private citizens. In August of 1990, we and a group of 28 other Americans flew together to Helsinki, Finland, and then boarded a train for what was then Leningrad (now St. Petersburg, Russia). We spent three days staying with a couple and touring, then boarded an overnight train to Moscow. Here we stayed with another couple for three days, and gave our first presentation to Russian speaking people. We then flew to Kiev, Ukraine where we boarded a river boat for a week, and floated down the Dnieper River to the Black Sea. During this week, our group of Americans got to know the 250 Ukrainian people on board. It was clear at this time that the USSR was about to break up, so many in our American group gave presentations on topics such as entrepreneurism, market economy strategies, democratic social structures, and Western approaches to psychology. It was on this river boat trip that we met a Ukrainian psychologist, Dr. Valentina Bondarovskaya, and began our 30 years of collaboration. 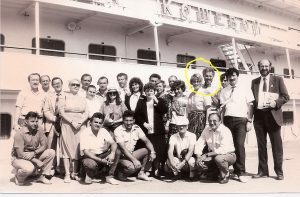 When the boat stopped at different cities on our return trip up the Dnieper, we noticed each time that the Ukrainians returned to the ship carrying big bags filled with fruits and vegetables. When we asked Dr. Bondarovskaya what this was about, she said, “The food here is clean!” meaning that it was less contaminated with radiation. Her statement immediately touched something very deep in us, and we realized our common Chernobyl experience. We shared about our time living in Switzerland and our own exposure to radiation. This bond opened discussions about how we might collaborate. So we invited Dr. Bondarovskaya to Colorado for a month. She spent January 1991 as our guest, participating in Barry’s classes at the University and one of our trainings on conflict resolution. Later that year, we and local colleagues went to Kiev and toured their (very inadequate) medical facilities. We also were the first group to debrief families who had been evacuated from Pripyat, the village where the reactor exploded. Their heart-breaking stories were part of impetus for Dr. Bondarovskaya’s founding the Ukrainian NGO ROZRADA International Humanitarian Center, which is legally linked to CICRCL through a warrant with the Colorado Secretary of State. 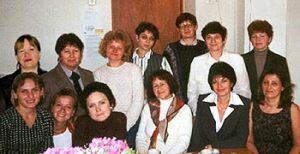 In 1994 Dr. Bondarovskaya brought a team of young women to Bratislava, Slovakia (where we had lived for 6 months in 1992-93 working on a project for the United Nations). Janae provided two weeks of training in Practical Psychology for this team, who returned to Kiev to work in ROZRADA. She and her team began offering social services, psychotherapy, consultation, training, and resources for individuals, couples and families who had been evacuated into Kiev and housed in remote parts of the city without any attention to their mental or physical needs. ROZRADA gradually expanded its mission to include support for Ukrainians struggling with the rapid political, social, and political changes created as a result of the fall of the Soviet Union. Janae has continued to collaborate with ROZRADA and other fledgling NGO’s in Kiev operated by her former students. she now visits Ukraine once or twice a year, and continues to mentor the young people who have become the lifeblood of a New Ukraine. Our work is well known there, as our books on codependency and counterdependency were translated into Russian and published there in 1995 and 2006.